This is the fourth in a series of one-on-one interviews with City Council candidates, speaking for and about themselves. Judie Mancuso is making her second bid for a seat on the City Council. This election will be different. Mancuso was seriously angry in 2016. Mancuso is now focused on issues rather than personalities. “I am more thoughtful now,” said Mancuso. “With three seats open and only two incumbents running: Now, I have a chance to win – it’s for real and I am willing to work with anyone elected, as well as the sitting council members. The lesson learned was the value of bringing stakeholders together, one of the personal qualities Mancuso considers essential for a seat on the dais. Currently, project and policy decisions are taking too long to come to fruition Mancuso said. “The council does a lot of bobbing and weaving, but there is a paralysis in making decisions,” she said. “If you can’t reach consensus, pick a side and run with it. We need to choose. If you spend $500,000 [for consultants], the city ought to be able to make a decision from that. If you pay out that kind of money and can’t come up with a plan, you are choosing the wrong [consultants]. Mancuso knows her way around state bureaucracy, which she believes is an asset. Besides the appointment to the state Veterinary Medical Board, Mancuso is the chief executive officer of three nonprofits, one of which is devoted to legislation. She said she has successfully worked on some of the most complicated legislation in Sacramento and has gotten landmark decisions signed into law by Governors Brown and Schwarzenegger. The bill is being reviewed by the Assembly. If approved it goes back to the Senate to be delivered to Governor Jerry Brown for his signature. Another of the nonprofits she sponsored is personalized license plates featuring dog portraits, designed by her close friend, actor Pierce Brosnan. Mancuso was also a leader in passage of legislation that prohibits the sale of puppy mill dogs in pet stores. “If I can accomplish those things, I certainly can take on the Historic Preservation Ordinance,” she said. After talking to her neighbors and others, she has reservations about the ordinance as proposed by the city. “We should have peace of mind and the quality of life we bought into,” Mancuso said. However, her personal priority is the protection of the ocean and open space. ”I am an environmentalist,” she said. Mancuso supports the Laguna Canyon Foundation’s recommendations for the Caltrans project on Laguna Canyon Road: Keep the undergrounded utilities poles within the proposed shoulder of the highway and shorten or eliminate the extension of the merging lane that includes the access to the Wilderness Park. She said she would not oppose undergrounding the rest of the road, but only on a pay-as-you-go project, without 25 years of debt as the City Council has put on the ballot. “I am fiscally responsible,” Mancuso said. “I pay my bills on time. I am not about debt. I would like to see the city run the way I run my checkbook and stay within its means. In any case, fire mitigation measures should take precedence over undergrounding, she said. Laguna’s homeless are also a Mancuso priority. She said the city must tap into county, state and federal funding. “We need to know what resources are out there and apply for and get the money,” said Mancuso. 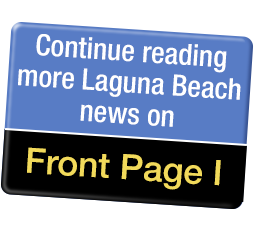 However, parking and traffic are still the number one issue with residents, said Mancuso, who moved to Laguna in 1995.